Do you feel overwhelmed trying to keep your home neat and tidy. I’ll admit, it’s been something I’ve struggled with, but I’ve found that once you have some systems in place, maintaining order in your home becomes much easier. 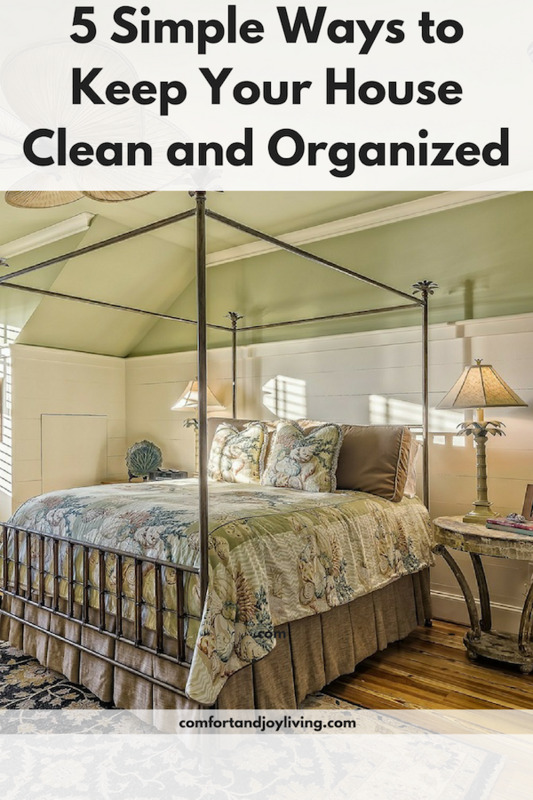 Here are 5 simple strategies to keep your home clean and organized. Every night, after everyone else is in bed, I take a few minutes before I go to bed to tidy up. By doing so, I’m able to keep up with everything and it doesn’t take me long to get things back in control. 2. Purge on a regular basis. Stuff can accumulate so quickly, that if we don’t declutter frequently, it can easily get out of control. Go over areas in your home regularly to see if they have become cluttered. When they do, get rid of any old, unused or unnecessary stuff. If you do frequently, you’ll find that the clutter won’t get out of hand as much. 3. Assign a few collection spaces. You won’t always have time to put everything away, so creating a space to place stray items can make your home neat and organized. I keep a basket or two around to place things in when I tidy up at the end of each day. Keep your organization system simple. Make things easier to put away by using open containers instead of ones that close. This is especially necessary with kids. I noticed that when I started using containers without the lids, my kids were more likely to put things away. 5. Place labels on everything you can. This is especially important in my children’s rooms so I know things will go where they’re supposed to (at least most of the time!). I placed labels on their dresser drawers, their toy bins and school supplies.